When I first started listening to ‘Available Light,’ this 53 year olds debut album, my first thoughts were that there were vocal and to a much lesser degree stylistic similarities to Tom Waits. It was not long though before I changed that impression to Tony Joe White on both counts and then shortly after that, included Sam Baker and even The Band before concluding that those similarities are vague and that he is in fact a complete one off! His own totally unique style has been labeled blues rock but as usual with monosylabic labels, that description is not only limiting but is also quite literally the tip of the ice berg, with so much more going on, making any generic label, however many words are used, totally irrelevant. I should say that it would be totally irrelevant were it not necessary to label everything for the sake of promotion and indeed for descriptions by reviewers but I’m sure that when you buy your copy of this album, as you undoubtedly will, you will hear what I mean! A lifetime of travelling all over the U.S and doing a variety of jobs to keep afloat have gone into the extraordinary songs on this disc, with even the most casual listener being able to recognize that these tales come from the heart of a man who has lived a full life and now desperately needs to share his experiences and perceptions in his own idiosyncratic musical style. There is often a swampy bluesiness that mixes with a little rock but ultimately the album may just as well be inserted under the ‘roots’ banner, although in many ways any label pinned to this man is pretty much an insult. 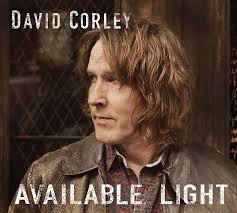 There is a warm depth to those raw gravelly vocals in much the same way as Whites but the scope of David Corley’s music is greater, avoiding any stylization of this tremendous album. That stylistic ambiguity often takes me back to Robbie Robertsons incredible 1987 solo debut album. In fact, any Band comparisons are not so far from the mark, albeit a general similarity in as much as the music is dense and intense rather than being reminiscent stylistically, although that ambiguity does of itself bring a stylistic similarity and when considering the sheer musical quality the depth and power are on the same level. Most of the songs have an easy rolling flow to them and yet at the same time are thick with an intensely dramatic, often dark, atmosphere on these engrossing, both reflective and questioning, tales. The gorgeous female harmonies that are a constant throughout this extraordinary recording, add a nice warmth to proceedings giving a lift and variation to the atmosphere of the songs. Beyond The Fences contains a slow moody almost talk vocal with nice chunky guitar and arrangement, with a supporting female harmony and a Hammond that adds a Band like density. It wouldn’t be too much of a stretch to imagine Sam Baker performing this song either. On The Joke, chunky guitars and bass are to the fore on an almost funky tale, with David’s raw vocal at it’s atmospheric best, gradually building the intensity of the song. It has a dense dramatic atmosphere, a thread that continues it’s enigmatic way throughout this phenomenal album. Easy Mistake is slow and moody with lovely melodic guitar meandering it’s way behind David’s moody, raw vocal. Piano and female harmonies add a stylistic variation to the song, something that contributes to the generic ambivalence throughout this recording. A deep bass, with tuneful guitar and keyboards starts the slow moody ballad, Unspoken Thing, before being joined by David’s heartfelt raw vocal, with slide guitar and Hammond segueing into the song and gradually adding density to the tremendous arrangement that purely on the strength of the vocals reaches peaks before fallin g back into a more reflective trough. Finally, The End Of My Run, is propelled by a gorgeous wash of melodic guitar sounds meandering their way through this tremendous tale of life catching up with the subjects mistakes, despite which, the answers are still not obvious. This could be looked at as a sometimes accurate reflection on life, with the beauty and melodicism of the music heightening the drama of a life that if not lived entirely on the wrong side of the tracks has certainly been lived without any priviledges other than those which he has taken for himself. This is an album that not only paints lyrical pictures but also creates an atmosphere that virtually delves into the mans soul giving a uniqueness to this 53 year olds debut that it wouldn’t have were he thirty years younger. The arrangements and playing are perfect for purpose and the albums depth of soulful feeling ensures it is a recording that will go on and on repaying repeated listening sessions, eventually, in all probability reaching classic status. Although his music has little in common, for sheer unique artistry, if he carries on producing this quality, David Corley will probably be talked about as being in the same class as unique artists such as Van Morrison. As a fan of ‘Van the man’ since his early days with ‘Them,’ that can be taken as the highest praise!